We are one of the leading manufacturers and exporters of high quality Eight Color Flexographic Printing Machine. This product is manufactured from finest quality of raw materials and is commonly used for printing packing materials such as plastic bag, glass paper and roll paper. This product is known for its high speed printing and low production cost. This product is available at cost effective market prices. 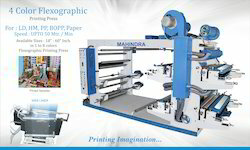 We are proud to present Flexographic Printing Machine for Woven Sack and Paper as part of our product range. These printing machines have precise design and fabricated keeping in mind the requirements of patrons. 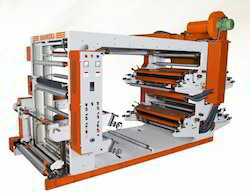 Therefore we consider this flexographic printing machine as the most successful one in the world markets. We offer a high quality Four Color Flexographic Printing Machine to our valuable customers. This machine is known for its low edition-producing cost that makes it ideal for a wide range of printing applications. This machine is highly appreciated for its novel appearance, small color process error and accurate printing. 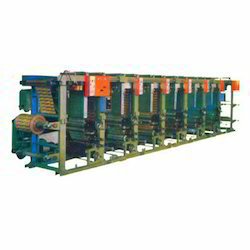 This machine is manufactured using latest technology and sophisticated plant machinery, to ensure high standards of quality. 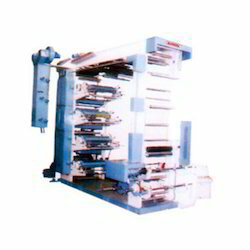 We are one of the leading manufacturers and exporters of optimum quality Rotogravure Printing Machine. This product is widely used for effective printing applications. The printing impression of this machine is controlled by motorized system. This product is known for low production cost, low change over time, and reduced wastage. This product is available in standard sizes and production capacity. Looking for Printing Machines ?